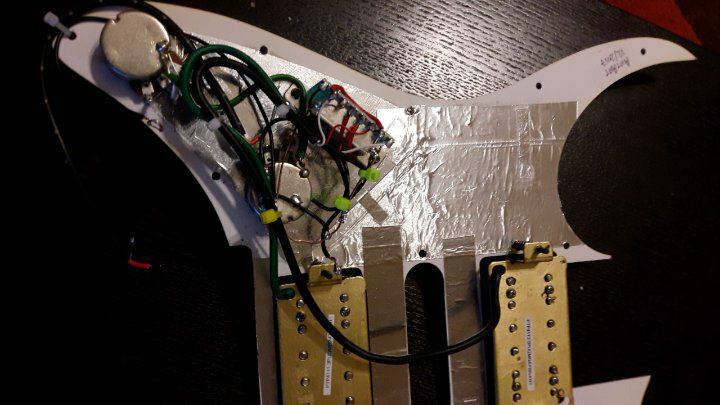 AntAnt gear, ideas and modifications! 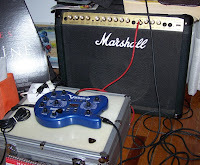 Main guitar setup with Behringer V-ampyre amp, Marshall UK 412 cab and FCB1010 controller. 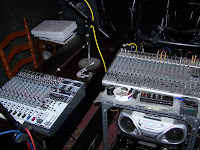 Behringer SL2442 console, under the eyes of Constantine! Greek Alder bodies and MightyMite necks w/Jumbo frets, with Iron Gear Hot Slag pickups, push-pull split (on volume pot) and 500uf treble bleed capacitor. I like them a lot! Left is an Ibanez RG421 bought new and then installed Iron Gear Hot Slag pickups (same as the ones in the two handmade naturals above), middle and top the lovely Chapman Rob Scallon RS, bought new also, a really great neckthrough guitar loaded with features and right, a Samick UM3 Greg Bennett, plays and sounds great, an uknown remarkable guitar that I got used from a friend, in great condition and in unbelievable price! 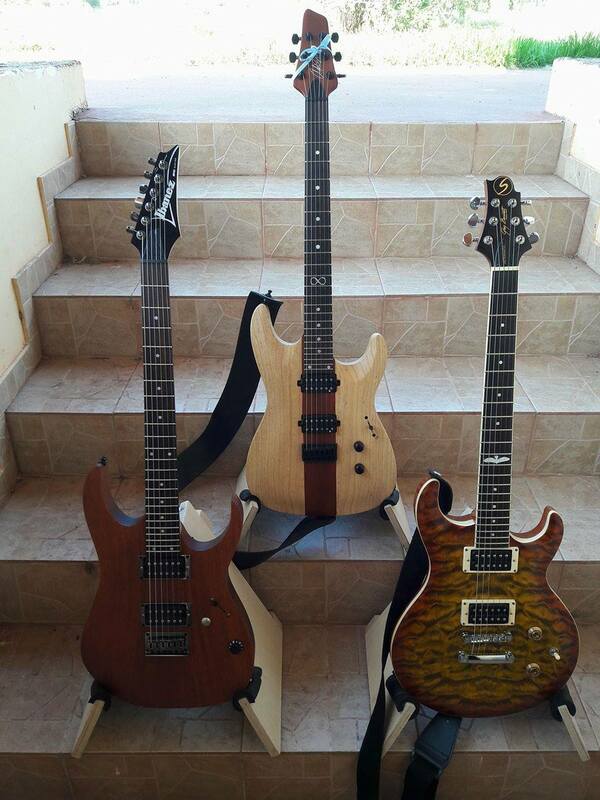 All three are lightweight, play like butter and sound loud!!! TD-6 KW module, Roland PD125 12 " snare , Millenium 12" and 10" toms with improved sensor system, 20" bass drum with piezo sensor and double bass pedal, two 14" floor toms with sensors inside, 3 Roland and 1 Millenium crashes-rides, Roland hihat , lots of mods and extra strenghtening legs on the rack. And this is the living-room setup! 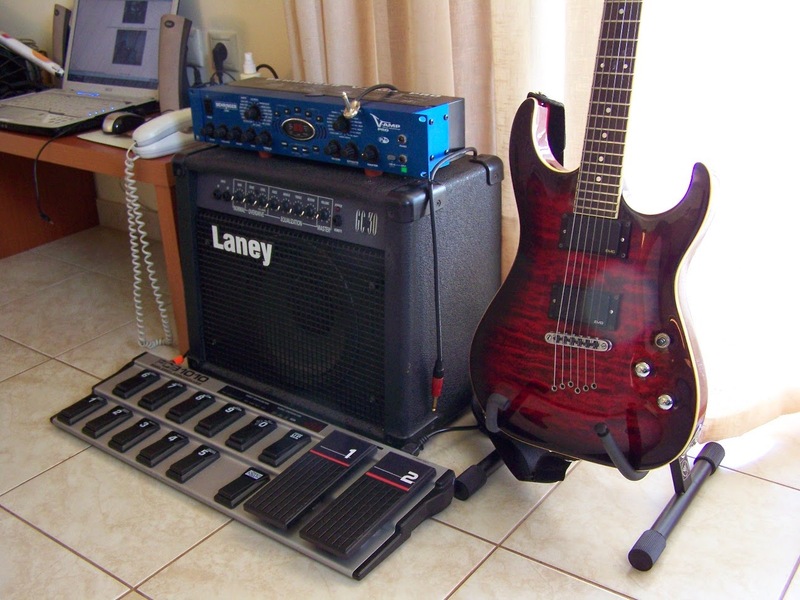 V-amp pro with Behringer FCB1010 midi pedalboard, Laney UK GC30 and my Washburn X50q with EMG 81/85. The V-amp, Laney and FCB1010 were bought used but in brand new condition from 3 different absolutely perfect sellers from www.noiz.gr , at a fraction of the original price, many thanks to Christos, Giorgos and Thymios! 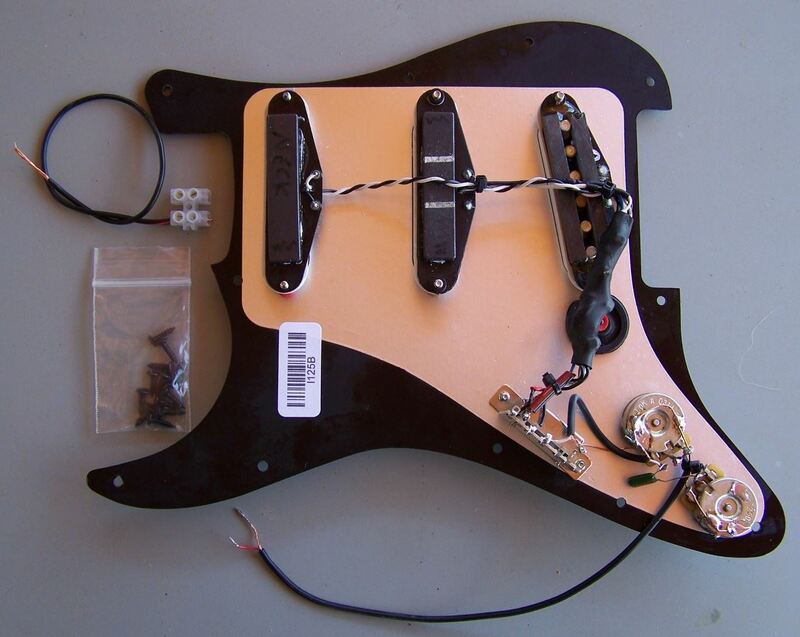 I got me a new S-S-S pickguard from Fender, two 500k pots, a 5-way switch, two Seymour Duncan Hot Rails, two DPDT switches (for series-parallel for every pickup) and an original Fender pickup. Then I put them all together! 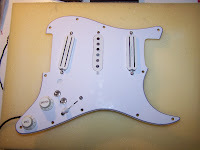 The white MIM Fender is a new guitar now! 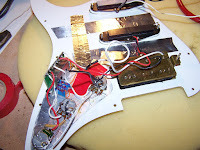 You can see the power amp rack here. 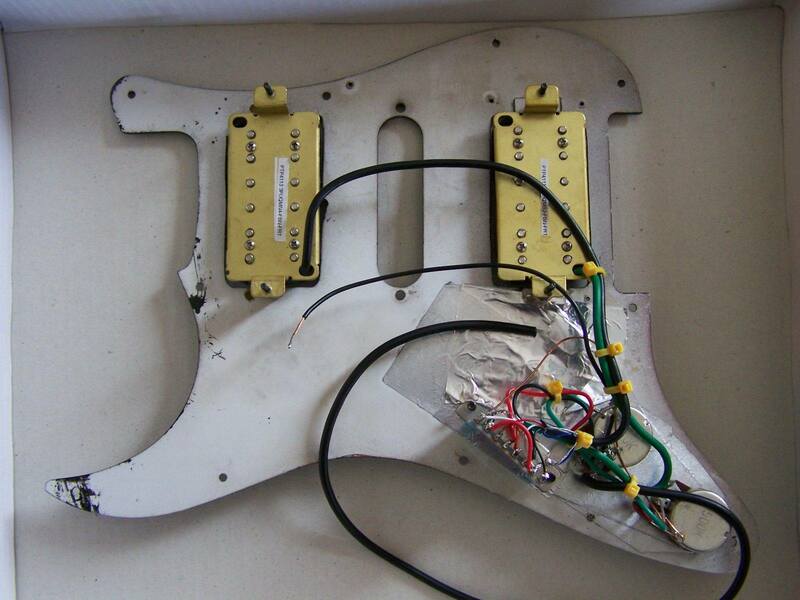 Behringer and Squier speakers. 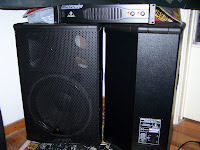 There is also a set of 2 USA Crate speakers, but I don't use them any more. You can see an old Sony 15" 5-way speaker (and another one next to Clavinova piano) for playing the playback when we record. This is the Behringer B1800X sub-woofer with 18" woofer. This gives us a lot of bottom end!!! 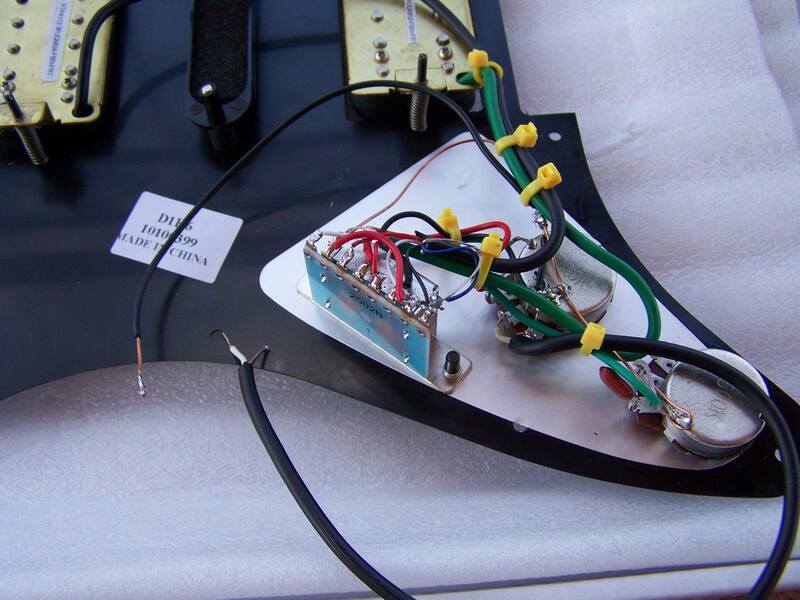 Above you can see a Squier 15" with HF driver, giving the drummer the full mix (left channel). It is located in his left. In his right, there is another Squier, giving the drummer the right channel full mix. 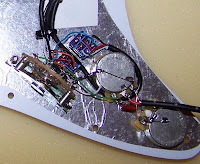 Below there is a hand-made 15" speaker with HF driver, playing only the sound of the drums. 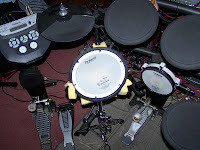 The great change in my home studio came with the purchase (2006) of the Roland TD-6KW e-drums. I tuned the Roland set to my preferences, along with tips from our drummer, and from another drummer who plays here. 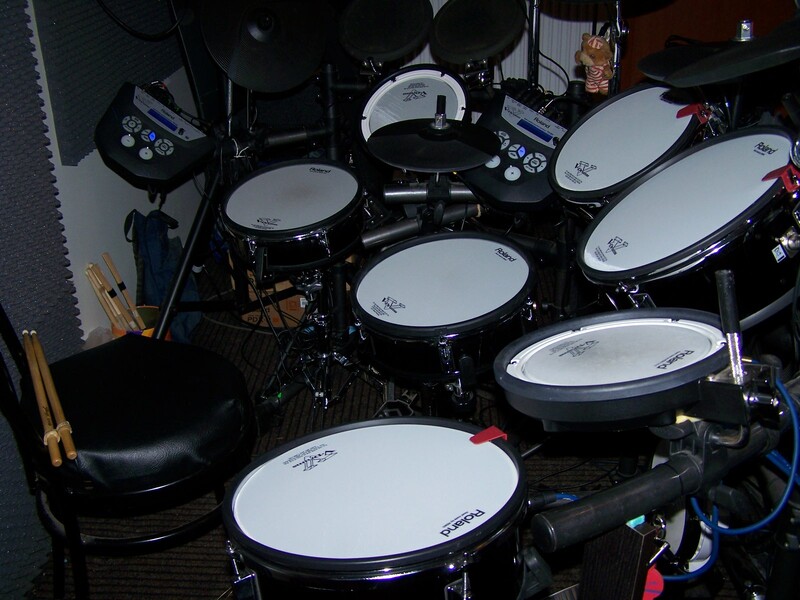 You can store 100 different drum sets, so it’s easy to go from rock to metal, or jazz. Their sound is very good, you won’t have to mic every drum instrument. The main mix is very full and clear, the vocals are very natural and we all hear a good sound, from whispering to very loud. The mix is ready to go to a computer for recording our rehearsals. 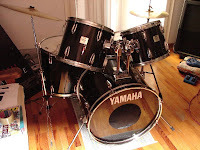 My previous drum set was a Yamaha DP-series, bought 1998, sold 2006, a very solid set (photo). The XENYX 1832FX console produces the main mix when we play live and we use the B1520pro speakers for monitors, powered by a . EUROPOWER EP2500 power amp. 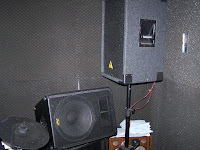 Their 15” woofer allows the bass guitar and the bass drum to be clearly heard. 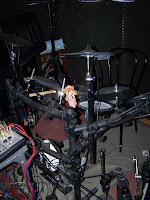 We are used to the sound of the e-drums of our drummer, so we can all hear the main mix through our monitors, which allows us to have a full idea of the sound our audience hears. Also, when we play on a bigger stage, set up by a sound engineer, we prefer to hear a loud mix from the side monitors, instead of having independent mixes through personal monitors (and, therefore, “hot” and “cold” spots onstage). The EURODESK SL2442FX-PRO is used for the home studio, producing the main mix and feeding signal to a WORK power amp, which gives output to 4 speakers, two (left-right) for the drummer (Squier 15”) and two (left-right) for the rest of us (Behringer B1520). The drummer also has two speakers on the floor, which play only the sound of the drums. 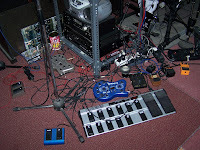 Here is a photo of the floor, mainly with Behringer V-amps for bass or guitar. 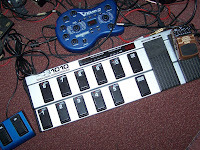 The V-amp 2 is my main floor pre-amp, along with Behringer FCB1010 midi controller. 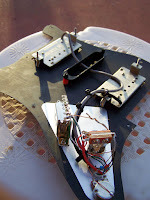 You can also connect it's Up-Down footcontroller simultaneously. I also have the Behringer Acoustic Modeller (right) which turns your electric to a very convincing acoustic! 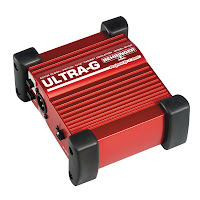 The Behringer GI-100 active DI is a very important part of my studio and live sound. 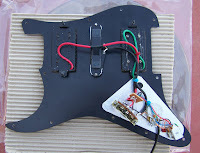 It takes the unbalanced signal from the V-ampII and transforms it into balanced with cabinet simulation also! I do not press any of the two PAD buttons, I just turn the V-amp almost at half the volume. 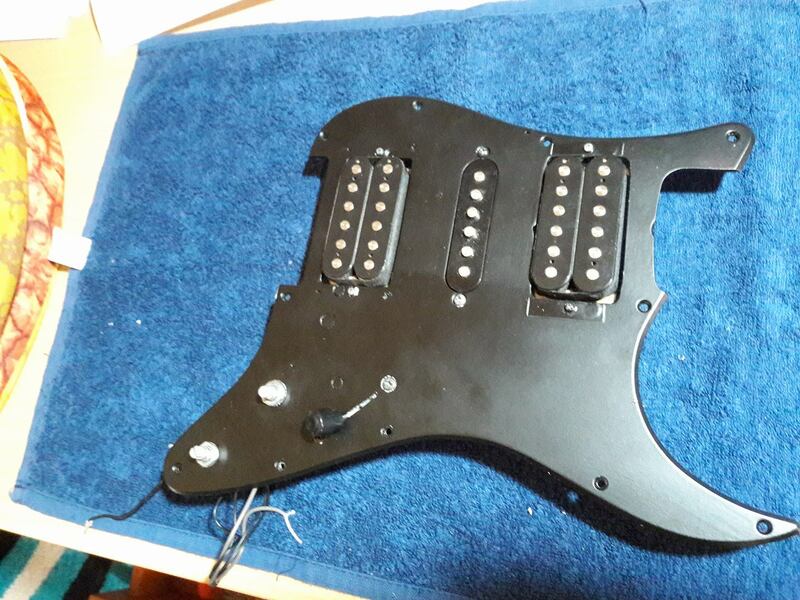 I mainly connect it directly to the PA console and I like the result very much. Also, when we play support to other bands, it is very convenient not to mess with the guitarist's amp. 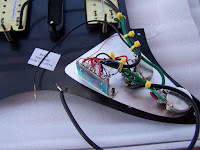 One guy's sound is another one's nightmare, so I don't go through the sound engineer's amp (and if I do, I use it only for my monitor), I always use my V-ampII with the red DI and the result is a very good tone in an instant! Another advantage of this method is that my sound is always consistent and it's not depended on the sound engineer's amp or the mic, or the stage (yes, the mics do get sounds from the stage floor, and this can be very annoying). 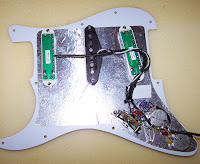 Check my band's blog here http://eleftheriptosi.blogspot.com/ (in Greek), you will se that I have played from very small clubs to very large setups, so I have gathered a lot of experience (and faced a lot of problems!!!). 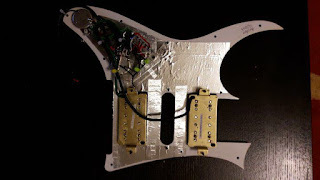 Since 2005, the V-ampII with the GI-100, solved a lot of them and gave me a good, clear, consistent tone, with great ease of use. 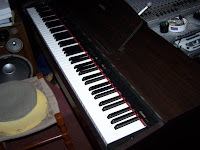 The Yamaha Clavinova electric piano is another part of my home studio. It is one of the simpler models, with 10 sounds. The feel of the keys is excellent, in my opinion. You can see an old Sony speaker with 15" woofer, two tweeters and two mid-range drivers, which does the playback in recordings. There is another one to the drummer's left side. 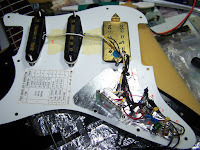 I must note that every cable in my home studio is hand made by me and then polymeter-tested! The same goes for the cables we use live. 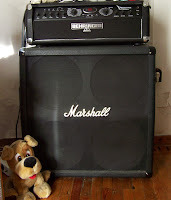 It’s the digital Behringer V-ampire head (the V-amp is in it) with an old (1995 I think) Marshall cabinet. I like the combination very much. 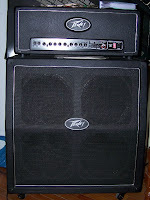 The Peavey Transtube EFX half stack is a very reliable amp, USA made, and a real loud one!!! Fully loaded with digital EFX. Bought 2005. 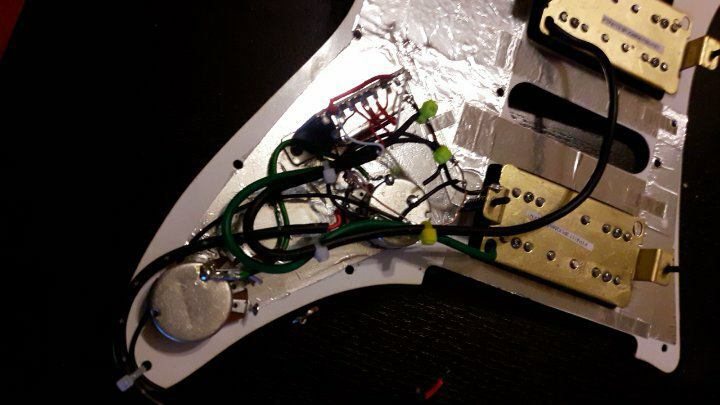 This Marshall is the only used piece of gear, all the rest were bought new. In the past I owned other USA Peaveys (Backstage, Bandit, etc.) which I sold. 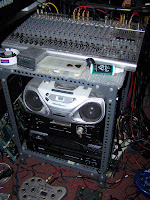 Nice amps, maybe a bit expensive in Greece, especially at the time I got them, in the late 80’s, early 90’s.